I’m a little disappointed in myself because I’ve let down my library. You see, I have an extremely high admiration for those hallowed halls, filled with all the wonder and adventure of great books. And I’m dedicated to protecting their valuable assets. So, failing the library system hits hard. Recently, for the first time in my 17 years of parenting, I had to pay for a lost book. As an “everything in its place” kind of person, this is a hard thing to admit. When my daughters were younger, I was so disciplined about keeping library books in our family room. As each kiddo got older, I started letting them take the books to their rooms. We’ve had a few close calls of lost books, but this is first time we couldn’t find the book. But, listen to how this all went down. One child (who has asked to remain nameless) got her account blocked for two books being way overdue.. She searched high and low for the books (and I realized there is actually carpet under her bed…we hadn’t seen it for such a long time). But, they didn’t turn up. So, we admitted defeat and paid the penalty. Later, I shared my remorse with the rest of the family, and another sister (who has also asked to remain nameless) chimes in…”Oh I have those books! I was wondering why I hadn’t gotten a late notice.” Whaaaaaat? Yes, she had used her sister’s library. And didn’t return the books. Luckily, the library will give me a refund if I return the lost books within 6 months. And I can be restored to my role as protector of library books. This whole saga got me thinking about the value of ebooks. Since they’re returned to the library automatically and are stored electronically, they CANNOT…GET…LOST. That means no fines for overdue and lost books! I’m a geek about finding learning resources online and love to share what I find at Techie Homeschool Mom. It’s my mission to inspire you and equip you to add more tech to your home education, and using eBooks for homeschooling is a great way to start. So, here are the three best eBook sources I’ve found…. Overdrive provides digital content to over 30,000 libraries around the world. It’s free if your library is part of their network. You borrow eBooks, audiobooks and videos and then access them using the Overdrive app on your PC or mobile devices. Epic! 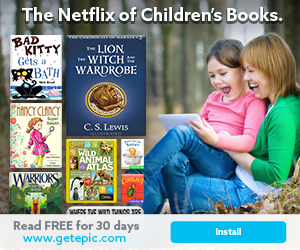 is an ebook library with thousands of fiction and non-fiction books for kids 5-12 years old. Epic! recommends books based on a child’s interests (which you share when you set up your child’s account) and keeps a reading log of their progress. The kids can read on the computer and mobile devices in a safe controlled environment. Kindle Unlimited allows you to read over 1 million Kindle books as much as you want. You can access your books from any device with the Kindle reading app (not just Kindles). You also have access to over 20,000 audiobooks. Wondering which site you should use? You can find out more about each by reading “Choosing the Best Email Subscription for Your Family” to help you decide. But, the best thing to do is try them for yourself. Fortunately, you can try them all for free. CLICK HERE to see if your library is hooked up with Overdrive and download the app to try it out. And try out Epic! and Kindle Unlimited for free. Just click the images below to sign up for your free trials and check them out yourself. Beth Napoli shares wisdom gained from 13+ years homeschooling her 5 daughters at Techie Homeschool Mom. She inspires and equips homeschooling moms to meet the needs of 21st century learners and incorporate more technology into home education. Beth’s not a computer expert; she just geeks out over cool webtools and online learning resources and loves to share what she finds with other homeschool moms. Beth is also the creator of Online Unit Studies, tech-driven internet-based thematic learning experiences and the hostess of the Techin’ Your Homeschool Facebook group.